Guide for Small EV Conversions? Is there a guide to converting a small car to electric, and a complete parts list of the needed hardware? I want to learn how, but I need help to know how. What is the best motor, what are the parts needed? Sure. Look around the "recommended reading" list over there and you'll find a conversion manual or two that I recommend. As for a parts list? Paul Holmes converted his VW Bug to electric for $2200, and included this parts list when he gave us an interview. You might find it helpful in your project, also. As for the best motor? The "best" motor is the one that matches your requirements most closely for the least amount of money. Right? So do you want to lay a trail of rubber on the pavement at each stoplight? Do you want a commuter workhorse? Are you the type to conserve your battery range and drive like a girl? Does anybody know what the make is of the car that is on the front cover of his book? P.S. You can read my review of "Build Your Own Electric Vehicle" here (and even order your very own copy if you like). It's still just about the best conversion manual you can get. The author has since passed away, but a new edition of the book has been written by Seth Leitman, and I think it's quite a bit better than the original. Electric Car Conversion on a Ford F150? 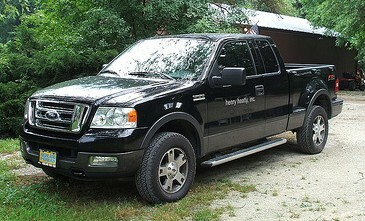 I have a small delivery company and wanna try to convert one of our trucks, a 1997 Ford F150, into an electric truck. I have a list of what I need, but need a how-to manual if any such thing is available. Check out my "conversion books" page. There are two classic electric car conversion manuals I think you'll particularly like: "Build Your Own Electric Vehicle" and "Convert It". Toward the bottom of the page is a downloadable step-by-step e-book (PDF) called "Electric Vehicle Conversions" which covers converting a Chevy S-10 pickup using a kit from Canadian Electric Vehicles. My son-in-law converted an 88 Toyota pickup a few years back, and he used a book called "Build Your Own Electric Car". I've been looking for it, and can't find it. Is it out of print? P.S. Learn more about building your own electric car by reading my article here.